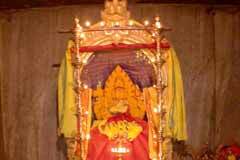 The car festival on the last Tuesday in the month of Chithirai (April-May) is celebrated in the temple for the past two hundred years. 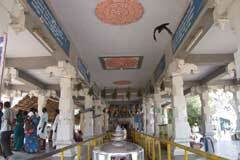 Water is taken from this temple to other temples in this belt for abishek before starting this festival. Sulakkal Mariamman is a Swaymbu. The scar caused by a cow is still visible on the deity. 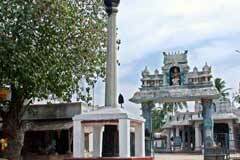 The temple is open from 6.00 a.m. to 8.00 p.m.
Sri Sulakkal Mariamman temple, Sulakkal, Coimbatore district. 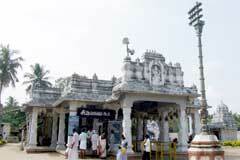 There is lamp post (Deepasthamba) and Flagpost (Kodimaram) at the entrance of the temple greeting he devotees. 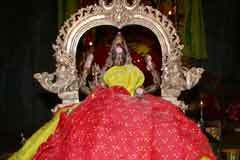 Sulakkal Mother Mari is known for her grace to cure the vision problems of Her devotees who are huge in number. Devotees stay in the temple throughout the day and apply the abishek theertha on their eyes praying for total cure. They are sure that their eyes would become bright with Her grace. Those having no child pray to Mahamayi and tie cradles in the Mavilanga tree for child boon. Devotees perform abishek and offer new clothes to Mother. Sulakkal Mari is mentioned in the Tamil Sangam literatures as Vadakku Vayil Selvi as She is facing the North. Vadakku in Tamil means North. All the abishek and pujas are performed to the Swayambumurthy only. 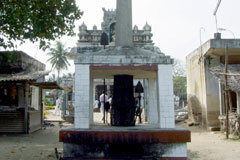 Mariamman appears near the Swayambu in the form of idol. 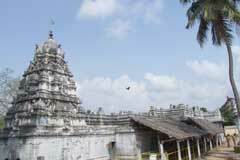 This is one of the important Mariamman temples in Coimbatore district. 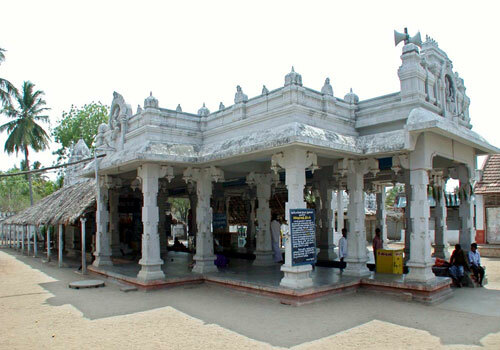 As there was a trident (Shoolam) near the Swaymbu the Goddess is called Sulakkal Mariamman. Mother Mariamman is gracing the 400 year old sanctum sanctorum in a sitting form with her right leg folded and holding Udukkai and a sword in the right hands and trident and a skull in left hands. The cows of the farmers of Velayudhampalayam were gracing in this region. The farmers found that the quantity of milk from the cows was coming down. They wanted to know the cause and watched the cows and found that they were pouring the milk in a particular place and drove them off. But the leg of one cow was caught in a bush and when it took off its leg, the swaymbu came out a little damaged. There was a trident also near the Swayambu. The scar caused by the cow’s leg is still visible on the deity. 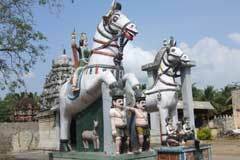 Ambika appeared in the dream of the owner of that particular cow and directed him to erect a temple for Her. The temple came into being then. Miracle Based: Mother Mariamma is a swayambumurthy. The scar caused by the leg of the cow is still visible. 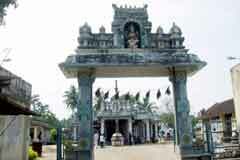 Sulakkal is three km from Kovilpalayam on the Coimbatore-Pollachi road on the west and 12 km from Pollachi. Bus facility is conveniently available both from Coimbatore and Pollachi. Hotel A P: +91-422-230 1773 (5 lines).